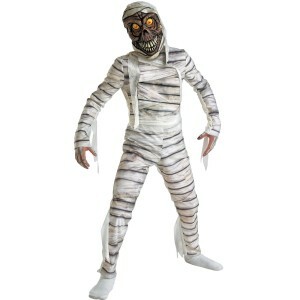 I spent the last few evenings making my son a mummy costume for Halloween. He looks pretty darned scary, if I do say so myself. Here’s how we did it: we bought an old, cream-colored sheet from the Goodwill and I tore it into strips. It tore very easily because it was older and I was tearing along the grain. Try one way or the other until it tears easily. Then we bought a pair of thin, black sweatpants and a long sleeve black tee-shirt (also from the Goodwill). I started with the legs and put a strip of cardboard into the legs and then started wrapping the strips and pinning them in place. Once I had each leg wrapped, I sewed the strips into place with a seam on each side, leaving them to hang a tiny bit in the middle and also room to move and get into the clothes. Do yourself a favor and measure after you pin and before you sew, but be careful of the pins during the trying on bit. Once the wrapping and sewing was done it was pretty much finished. Just take extra straps and wrap around the neck and head and as much face covering as you want. I sewed a few extra strips together to make that easier. The pants were a bit too long (not on purpose, but it worked out well) so they overlap his black crocs and make good mummy feet. For hands we are trying to find the black skeleton gloves he wore with last year’s Halloween costume or find some old brown leather gloves or black knit ones – we’re flexible and creative at our house! This cost about $10 and took three hours total, so inexpensive, though a lot of work, but mostly spread over four nights, so didn’t feel so long and was really a labor of love. 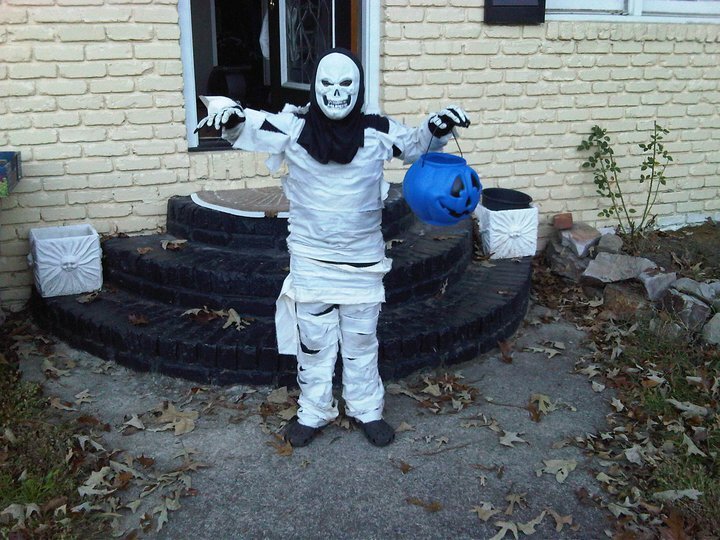 This entry was posted in Life and tagged Halloween, Homemade Costume, Mummy. Bookmark the permalink.